High density polyethylene plastic shell protects TWO pairs of Alpine shaped or powder skis and poles, or ONE pair of ‘fully stacked’ race/carve skis. 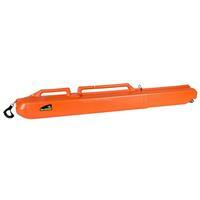 This plastic ski case is designed to be lightweight while being strong and durable. This carrier is the best! I love that it handles easily moving thru the airport and it is compact and adjustable to multiple sized skis. You can add a TSA lock to bump up security on your gear. Made it from PHL to PDX with no worries. Great for those who like to travel all over the world to ski. Hard case provides great protection when on airlines. Wheels allow easy transportation. Had a double ski box destroyed by airline. Holes punched through, skis delaminated due to crushing. Airline paid only because case was "hard". Purchased my second box and hoping for the best every time I check in. Case is too thin for ultimate protection. But, thicker would be heavier. Wheels are small and corrode. Just like any other person, I'd rather someone else carried my skis. Now that I have this double ski case, I don't mind it as much. After watching the airline drop my ski bag 15’ from the plane to a baggage trailer, I decided to buy one of these. Since then I’ve traveled to Europe, Canada, and out west without any problems. Last year I bought the Sport Tube backpack and the two work great together.